I love summer. 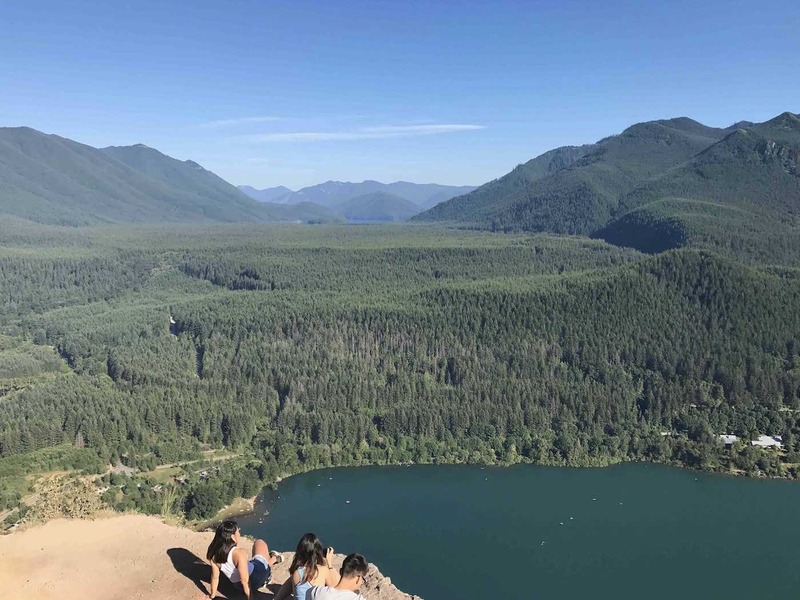 I’m having so much fun hiking, camping and exploring. All this time outside is really testing this experiment in online passive income. I did one good thing though, I scheduled blog posts out weeks in advance this month. Most of the posts I published in July were written in June. That simple hack allowed me to enjoy the summer a bit more. I can be a bit of a workaholic and have to actively chill out, so that I can enjoy beautiful views like this one. 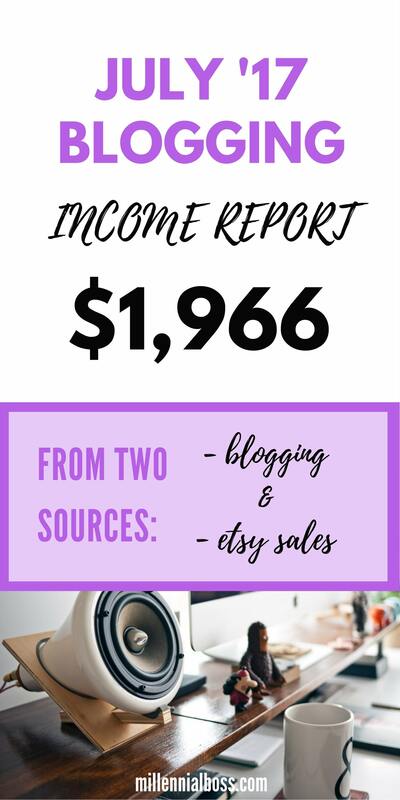 I can’t forget about my June Online Income Report where I shared I made $2,173. Feature Friday is my weekly post where I interview those who have paid off student loans or who own their own business. My Feature Friday guests this month were entrepreneurs and epic side hustlers. If you’d like to be featured on Feature Friday, learn more here: Get Featured on Millennial Boss. I switched one of my top earning products to Impact Radius this month because I was having trouble with the product’s integration with Flexoffers. I still recommend Flexoffers though and made a few hundred on it this month. Besides that switch, everything else is pretty much on autopilot and on par with what I reported last month. I want to post this graphic to show that my organic search traffic is up significantly from a year ago. It’s still only a percentage of my daily traffic but that’s pretty cool. The SEO stuff I’ve been working on is paying off. Pinterest brings in tens of thousands of new readers per month for me. Hi, if you’re from Pinterest! Welcome! I want to focus on growing Pinterest traffic further this month. Don’t have a blog? Here is my tutorial on how to start a blog. I’ve been hearing about this Pinteresting Strategies ebook for awhile now. The name is popping up on other bloggers’ income reports and in Facebook groups I’m in. It’s getting so much recognition because Carly, the author, uses a manual pinning strategy. She only uses schedulers (like Tailwind and Boardbooster) for the reporting and analytics services they provide. I usually don’t like spending money on things that I don’t need but I decided this time, why not. One of my more popular pins is slowly dying and that pin produces a good portion of my income. I use Tailwind (for other people’s pins) and Boardbooster (for my pins) to “set it and forget it” but I’m open to manually pinning a little bit too, especially if I can get a big return from it. I downloaded the book for $32 and then devoured the 90+ pages in one sitting. I plan to re-read it again this month so I can map out a strategy for next month. I need to be more cognizant of pinning from a group board every time I leave a pin. The better repin rate a board has (which I can help by repinning), the better it will be for my own pins. I think Carly is 100% spot on with this one. I’ve made more of an effort this month to repin from the group boards I’m on and have seen a difference. By the way, I have two group boards if you want to join and agree to repin: The Millennial Generation and Rich Chicks Only. I need to remember that Pinterest can “see” pins so try not to use the same stock photos everyone else has, or else it gets confused about what the post is about which hurts recommendations. When I read this, I was mad at myself for not thinking of that first. I will often use the same stock photo to write about debt that someone is using to write about travel or fitness. That can be confusing. Carly is smart about her business and it shows in the book. Tip: You can buy limited-release stock photos at places like Ivory Mix and SC Stockshop to avoid this problem of having the same pins as everyone else. Carly’s book is seriously really good and is definitely worth the money. $32 is cheap in the Pinterest world. Click here to learn more about the Pinteresting Strategies ebook. Etsy income was bouncing back this month until I killed it mid-month. I tried to update my descriptions to be more keyword rich and think I may have accidentally keyword stuffed. My orders ceased around the time that I did that, even though impressions went up. Either that, or my listings are ugly. Anyone have any Etsy advice? By the way – this is my return on advertising spend. I lost $2.76 and my time (well really my husband’s time) shipping the product. He helps me with shipping since his schedule is more flexible. 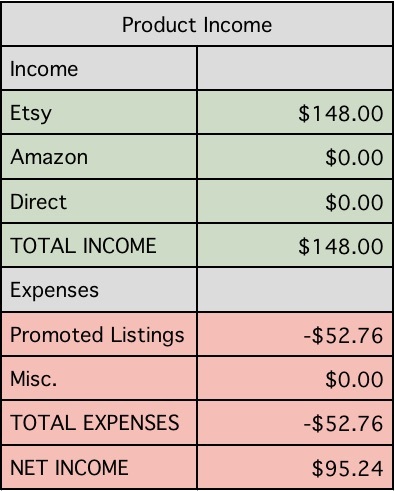 This chart doesn’t show the $95 I made not from sponsored listings. I guess it’s a good thing, even if I broke even, because more orders means more reviews which means more people will feel comfortable with my product. My competitors have thousands of reviews and sales so I’m a bit of an underdog. I also put much less time into this side hustle. I didn’t work with any clients this month. I haven’t been actively promoting my blog coaching business except for in these income reports. I only have the time to take on 1-2 clients per month so this works for me. The clients that I have worked with in the past, have come to me with very specific blogging questions. Typically it is regarding something that they have seen on my site that they would like to duplicate on theirs. While you can always email me or tweet me @millennialboss, it’s easier to talk in-depth strategy 1×1. If you’re interested in chatting with me this upcoming month, sign up here for Blog Coaching. I’ve been hearing and seeing a lot of shade about blogging income reports lately. Specifically that some don’t contain enough information and aren’t helpful. It’s on the reader to investigate and put the hustle in to make them useful. I’m assuming the shade is because of a lack of understanding of how to make use of a basic blogging income report with just the product listed and amount earned. 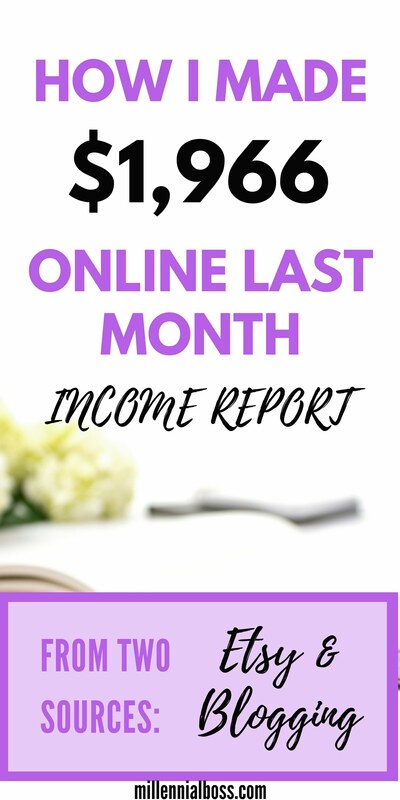 These types of income reports are common because it takes time to bring together income from 15+ different affiliate sources every month and then write about it. I understand why some bloggers do the minimum. Blogging income reports are often the least-fun posts to write and it feels weird to share this stuff sometimes. So I don’t fault bloggers who are light on their income reports. If you read that a blogger makes money on a certain product, search their site for mention of that product. Which posts promote that product. What features do they highlight, what language to they use, how often and how do they link to it? Then compare it to their Pinterest profile (or whatever social media they say works for them) to see which pins are the most popular and which ones lead directly to pages with that product. You can be confident that one of the posts is driving their income or a small handful of posts. Unless they are a very popular blogger, most of their income probably comes from a handful of posts. Some bloggers will even lay out their most popular posts or continue to link to them over and over so you know which ones they are. That is how you learn what works (is converting for them) and what doesn’t if they don’t explicitly tell you. If the blogger omits traffic, you can get that from other third-party sources too like Alexa. You can pull information about their social following and growth yourself too. Or, just straight up reach out to them. I’ve had people DM me specific questions and I love that. Give me the product, how much money you made, and I’ll investigate the rest. In Big News, I’m Starting a Podcast with Gwen from Fiery Millennials~! Gwen from Fiery Millennials is a good friend of mine and we decided to team up to start a podcast! AHHH! I’m so excited about it. We just recorded two episodes and we’re having a blast so far. If you want to be notified when the podcast goes live, join this email list. What side hustles do you have going on this month? Wow you’re doing great! Pinterest is new territory for me and I’ve been slowly getting into it. I may look into that ebook you mentioned. Thank you for sharing your income report! I find it so motivating to read other’s stories, it just shows me that I still have a long way to go. So inspiring! I feel as though I am a little too small to start monetizing my blog but this is good information to remember. I love how business oriented your reports are! It’s really helpful to see the full breakdown of each stream. Appreciate the transparency. Once again, I’m shown that I need to start doing stuff on Pinterest. I’m setting aside some time this week to dedicate myself to it. I did a search and couldn’t find your post about the product you sell on Etsy. I’ve done a few things on there and could take a look to see if I have any tips! It’s a shame blog income reports are getting shade. I think a lot of people just don’t like working hard. You’re doing such a great job! I’m so excited for you. Regarding the Etsy question. Yeah, it just sounds like when you “stuffed” some more keywords, which got you more views but wasn’t maybe exactly the description. It’s hard to say without actually seeing it myself. Maybe show me at fincon? I’d love to see and talk to you more about it. Been thinking about opening up my own etsy shop so maybe talk over drinks? Congrats on a great month of income! Thanks for sharing the Pinterest tips! I’ve seen Carly’s book mentioned in a couple of blog reports but haven’t bought it yet. I usually pin from group boards too. But I’m sure she has a lot more tips that I need to check out. Looking forward to the podcast! Keep up the good work, MB!